The Flash may have been reborn, but his overnight ratings don’t seem to be… yet. The series had a 1.0/4 in the Ages 18-49 demo for the season premiere “The Flash Reborn” on October 10 with a total of 2.8 million viewers according to the overnight ratings; those numbers can and will go up. On the bright side, that demo number is still better than, say, Marvel’s Inhumans on ABC… and the show did beat Lethal Weapon in the same time slot in the demo. On the down side, it’s lower than where The Flash usually is, especially for a season premiere. Hopefully once people get used to the show being back the numbers will go back up. Next week’s episode is very good and worth watching live. And, of course, the final numbers for the season premiere can and will go up once streaming and DVR are factored in. What did you think of The Flash season premiere? Come talk about it on our Flash forum! You can see what’s coming up next here. I’ll take a 1.0 in today’s environment, especially if it doesn’t drop in the final numbers. I’ll put it this way; I’ll watch all the episodes of this show again. But this episode I will not watch again. It was nice to see Iris have a different role and see how the team was managing without Barry. But I strongly feel that A: The could have brought Barry back a little later in the season B: The whole thing with Barry in his crazy phase and how he just quickly snapped out of it after learning Iris was kidnapped C That Tracy wasn’t still part of the team and D: I was wondering how is is the Star Labs still functioning right now? I think it would have been better if the Samuroid was a new Meta perhaps instead of it being a robot. Although it did lead to a good reveal of The Thinker. But also it would have been nice to see how Wally was dealing with taking up in Barry’s absence more than just one episode. Needless to say, there could have been much more better things done with this episode. Hopefully they can explain some more later in this season, I was quite disappointed with this new episode. Yep! I just said the same. Barry came back too soon and it’s costly with many fans. 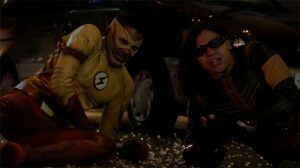 That gun Cisco had should have been used, deemed unsuccessful, and passed the suit over to Wally. I also feel that Barry got a new suit too soon, let alone how crappy it was for them to introduce it. The scenes of Barry losing it should have been saved for the next season. You want to give us such an awesome teaser but give us reason y’know? I’m questioning why, as I mentioned before Wally is there and he looks pretty awesome in the suit might I add. As for Samuroid, he could have played a much more prominent role than just one episode and yet do I still question how he’d even known that Wally donned the suit? I was pretty lost there. Like you was I disappointed and also like you will I give it a shot, but I also noticed that while Wally fought him and the stab was a follow up. .what happened to his healing factor? As I told a few of my other friends. Barry came back too soon which resulted in other characters completely lacking spotlight with an example being Wally. Right now I haven’t a clue at this point why they’ve introduced a legendary speedster and we barely see anything with him, let alone donning the suit for the first time which to me was also a means of trolling us fans. But, when you that is it paid for hence the ratings. I could have done without Gustin for this entire season to be honest and not at all is it due to criticizing his skill set with acting! It’s preferred that we have more Wally. Yep. The show is called the Flash. We get it. But Wally too, was the Flash.